Actor Gary Coleman, actress Natasha Richardson, and famed nutritionist Dr. Robert Atkins all passed away from complications due to traumatic brain injury (TBI). Unfortunately, these are not isolated cases; an estimated 1.7 million people sustain a TBI in the United States every year . We have developed a novel ultrasound device that has the potential to change the narrative, and prevent future stories like these from ending in similar tragedy. Since its technological development in the 1960s, ultrasound imaging has become an indispensable tool in the healthcare industry. Most everyone has seen or shared ultrasound images of a developing fetus, but cardiologists, anesthesiologists, and emergency room doctors also routinely use ultrasound imaging to evaluate their patients. Yet, as useful as it may seem, one would be hard-pressed to find ultrasound images of the brain. This is due to a fundamental difficulty in transmitting ultrasound energy through bone. As a result, clinical ultrasound has been optimized for signal propagation through soft-tissue, like that found in the abdomen, as opposed to hard tissue, like the skull. However, recent technical advancements in ultrasonic transducer design have opened up exciting research areas within the field of clinical ultrasound and have challenged the limits of ultrasound in medicine today [2, 3]. Many transcranial ultrasound applications to the brain are currently being explored , including the detection of bleeding inside the skull, known as intracranial hemorrhage (ICrH). ICrH leads to elevated pressure inside the skull, preventing oxygen from reaching portions of the brain, and in extreme cases, causing brain herniation and death . TBI is one of the primary origins of ICrH and is a leading cause of injury-related deaths in the United States . For the best prognosis, it is crucial to determine if ICrH has occurred following moderate to severe TBI as soon as possible. X-ray computed tomography (CT) is the gold standard for establishing the extent of injury following acute head trauma [6, 7], but it can only be performed in a hospital, unlike ultrasound. The portability of ultrasound devices makes them available to emergency medical technicians and emergency physicians for assessment of TBI. Using ultrasound in real-time to perform a preliminary evaluation while en route or immediately upon arrival to a hospital would help prioritize treatment strategies and expedite surgical intervention, thus saving lives. Moreover, it is common for progressive complications to occur postoperatively , so bedside monitoring with an ultrasound device would provide an additional layer of detection for new or worsening ICrH. In contrast to CT, ultrasound is non-ionizing, affording a safe, continuous way to surveil patients during this critical period when recurrent ICrH is most likely. The present state-of-the-art technology in clinical ultrasound requires an acoustic window to achieve a sufficient signal-to-noise ratio for detection of ICrH . This is typically achieved in adults either through a craniotomy, in which a portion of the skull is surgically removed, or via transmission through the small, thin temporal region of skull. However, due to the invasiveness of craniotomies, and the lack of a temporal bone acoustic window in 10-20% of adults , these methods are far from ideal. The goal of this research project was to improve on the current clinical methods by providing proof-of-principle that low-frequency ultrasound could be transmitted through the skull without being limited to an acoustic window to accurately detect acute ICrH associated with TBI. Using a single element ultrasonic transducer with optimized aperture geometry and focal depth for intracranial anatomy and low frequencies on the order of 0.5 MHz (see Fig. 1), our group demonstrated that it is possible to detect epi- and subdural hematomas – specific types of ICrH adjacent to the skull and often resulting from TBI [5, 7]. Figure 1. 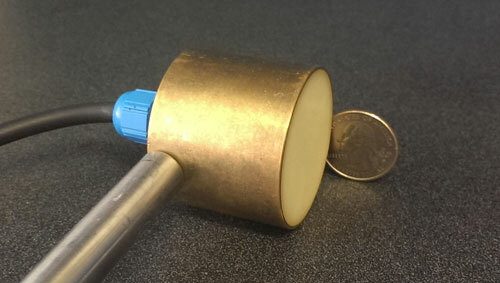 Picture of the single element ultrasonic transducer used in this research project, with a quarter shown for scale. First, the ultrasonic transducer was characterized to confirm the focal depth and beam profile, and a soft-tissue phantom that mimics the ultrasound properties of the brain was developed. Next, an ICrH scenario was constructed using ex vivo human skulls, the brain phantom, and coagulated swine blood specimens. A preliminary study using six human skulls was conducted to determine system viability, and the results showed an observable signal from the hemorrhage-brain interface, the intersection between the blood clot and brain tissue where the difference in ultrasound properties of the two media gives rise to a reflected signal. Finally, the device performance was assessed in a study aimed at measuring the minimum recognizable clot size inside the skull. More specifically, in our final experiment blood clots of varying sizes were combined with the brain phantom and tested for detection accuracy using a set of 10 different skulls and nine points arranged in a grid on each skull (see Fig. 2). Samples of reflected signals were presented to four readers who were blinded to the clot size and asked to identify the signal corresponding to the hemorrhage-brain interface (see Fig. 3). Detectability, the ratio of correctly to incorrectly identified hemorrhage, was calculated for each clot size (see Table 1). 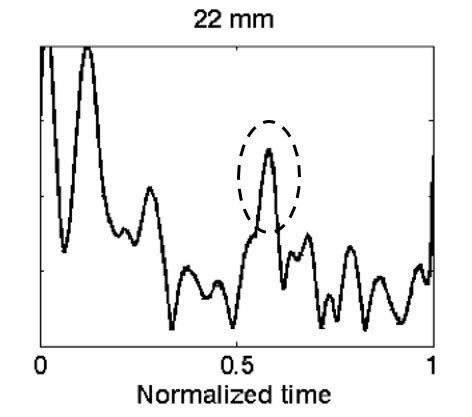 Based on the results it was concluded that it is possible to identify ICrH, with apparent peaks in the signal, as small as 13-mm in axial thickness with up to 78% detectability. There was a noticeable decrease in detectability for clot sizes with thicknesses below 13-mm, due to signal reverberations arising from the skull adjoining the hemorrhage-brain interface signal. Figure 2. 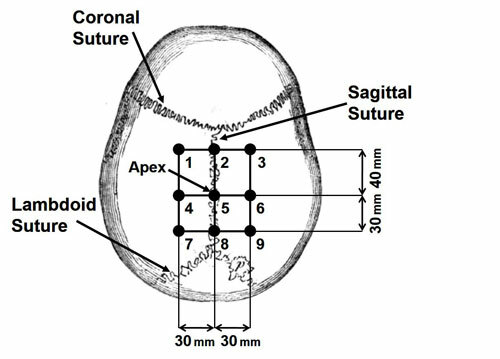 An illustration of the nine points on each skull used during hemorrhage size detection experiments, with sutures shown for anatomical reference. Figure 3. Reflected signal from the hemorrhage-brain interface of a 22-mm thick blood clot shown in the dashed circle. Signal reverberations from the skull can be seen in the left of the figure. This is an A-mode ultrasound signal where the amplitude of the signal is on the y-axis, and the time delay to receive the signal is on the x-axis. Table 1. Hemorrhage detectability for varying clot thicknesses. In conclusion, our results indicate that a single element ultrasonic transducer optimized for intracranial anatomy could be used to detect ICrH associated with TBI with a thickness as small as 13-mm in the axial direction. Surgical removal is recommended for hematomas with thicknesses greater than 10-mm , making our device clinically applicable for detection of hematomas within this size range. A low frequency ultrasonic pulse has been shown to propagate inside the skull, and the difference in ultrasound properties at the hemorrhage-brain interface yields a reflection of the ultrasonic pulse that can be detected by the same transducer element. This research project focuses on the development of a new technology; therefore, the method has not been demonstrated in clinical trials. Further work is being conducted to improve on the findings reported here, including moving towards clinical validation of our transcranial ultrasound hemorrhage detection device. M. Faul, L. Xu, M. M. Wald, and V. G. Coronado, Traumatic Brain Injury in the United States: Emergency Department Visits, Hospitalizations and Deaths 2002–2006, Centers for Disease Control and Prevention, National Center for Injury Prevention and Control, pp. 1–72, 2010. K. K. Shung, “Diagnostic Ultrasound: Past, Present, and Future,” J. Med. Biol. Eng., vol. 31, no. 6, pp. 371–374, Jan. 2011. P. J. White, “Transcranial Focused Ultrasound Surgery,” Top. Magn. Reson. Imaging TMRI, vol. 17, no. 3, pp. 165–172, Jun. 2006. P. J. White, G. T. Clement, and K. Hynynen, “Longitudinal and shear mode ultrasound propagation in human skull bone,” Ultrasound Med. Biol., vol. 32, no. 7, pp. 1085–1096, Jul. 2006. A. M. Naidech, “Intracranial Hemorrhage,” Am. J. Respir. Crit. Care Med., vol. 184, no. 9, pp. 998–1006, Nov. 2011. A. I. R. Maas, N. Stocchetti, and R. Bullock, “Moderate and severe traumatic brain injury in adults,” Lancet Neurol., vol. 7, no. 8, pp. 728–741, Aug. 2008. T. A. G. M. Huisman, “Intracranial hemorrhage: ultrasound, CT and MRI findings,” Eur. Radiol., vol. 15, no. 3, pp. 434–440, Mar. 2005. J. Naqvi, K. H. Yap, G. Ahmad, and J. Ghosh, “Transcranial Doppler Ultrasound: A Review of the Physical Principles and Major Applications in Critical Care,” Int. J. Vasc. Med., vol. 2013, pp. 1-13, Nov. 2013. D. E. Haines, Neuroanatomy: An Atlas of Structures, Sections, and Systems, Eighth, North American Edition. LWW, 2011.